Jamaica’s new Houses of Parliament will be designed by a team led by local architect Evan Williams of Design Collaborative. 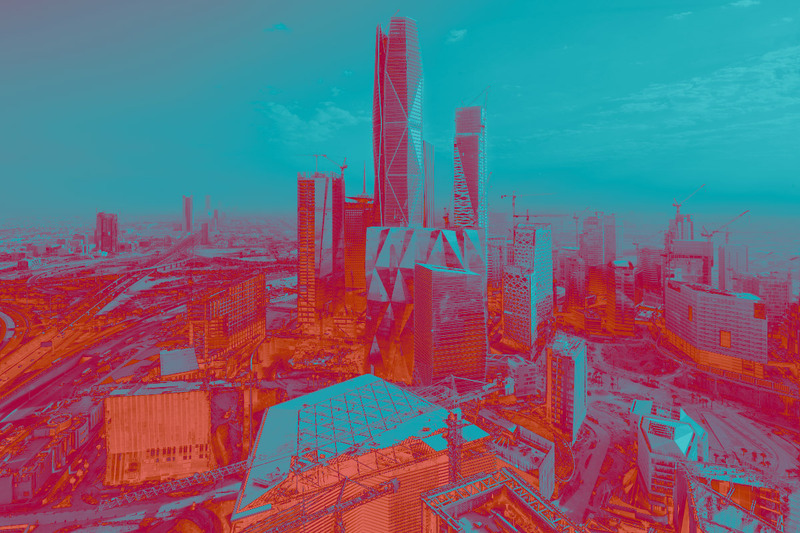 The group beat out 23 other teams, including ones with Adjaye Associates and Adrian Smith, in an international competition. "Out of Many One People," the name of the winning proposal, will be constructed in Kingston’s National Heroes Park. 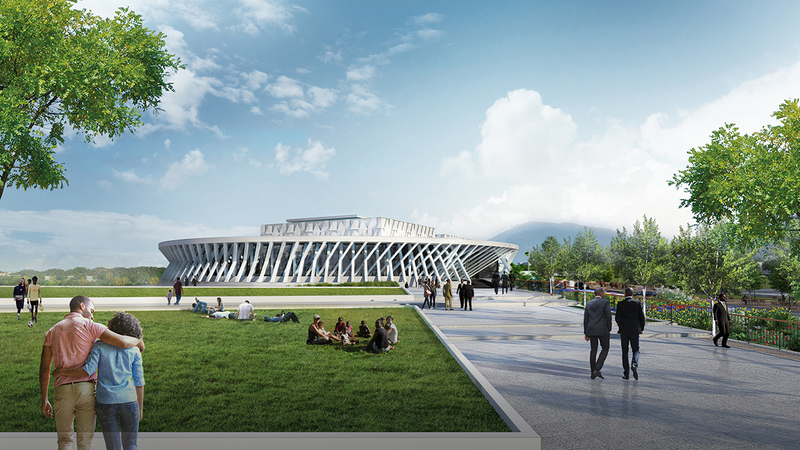 The team submitted a circular, monumental design reminiscent of a stadium. 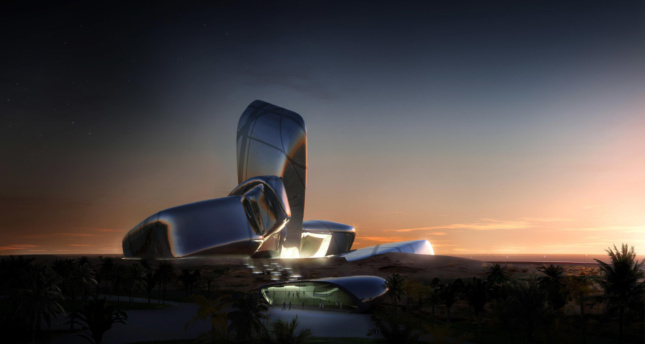 It features diagonal bracing on the exterior and includes surrounding landscaped areas for sports and cultural activities. Set within an 11.4-acre piece of parkland, the project is part of a master plan to redevelop downtown Kingston. Jamaica launched the competition last May to find an architect to design the 160,000-square-foot building that will house both the legislative and executive branches of government. Gordon Gill, a partner in Adrian Smith + Gordon Gill Architecture and a native of Jamaica, served as the competition patron. To enter the race, there was one strict but unique rule: Eligible teams had to be led by a citizen of Jamaica, residing locally or abroad, who is also a registered and licensed Jamaican architect and capable of being the project’s architect of record. The teams also had to contain “at least 50 percent Jamaican citizens or persons of Jamaican heritage.” Twenty-four teams entered, including groups from the United States, United Kingdom, Canada, Italy, Argentina, Turkey, Serbia, Iran, Trinidad, and Guyana. Five finalists were selected last fall, but “Out of Many, One People” won out. The jury called it a “grand and heroic gesture.” The entry was a collaboration between architect of record Evan Williams of Design Collaborative Architects and Town Planners, lead designer Damian Hines of Houston-based firm Hines Architecture + Design, as well as Christopher Bent and Gregory Lake. Their submission was also selected as the People's Choice winner. The competition organizers, the Urban Development Corporation (UDC) hope the government will line up funding in time to begin construction in 2021. Other finalists are listed below. View their submissions here. Second place: "The Grand Verandah" Team leader: Ravi Sittol of Atelier-Vidal Ltd. of Jamaica. Team: Atelier-Vidal Ltd./Adjaye Associates, including Vidal Dowding and David Adjaye. Third place: "Ubuntu" (“I am because we are”) Team leader: Damian Edmond of Form Architects in Kingston and Trinidad, West Indies. The team included Edmond and Franz-Joseph Repole. Fourth place: "National Flower" Team leader: Stephen Facey, chairman and CEO of PanJam Investment Ltd. and Jamaica Property Company Ltd. Team: Facey, Hugh Dutton, Laura Facey Cooper, Jenna Blackwood, and Patricia Green. Fifth place: "A National Veranda" Team leader: Guenet Anderson of GSA Architects and Planners in Jamaica. Team: Anderson, Emerson Hamilton, Adam Bridge, Lee Edgecombe, Dwhyte Batson, Cheryl Hamilton, The Edgecombe Group of Hyattsville, Maryland., CTA Consulting Engineers and DCI Architects of Rockville, Maryland, SK&A Group, Moya Design Partner, Hamilton Associates, AMAR Grou, and Alter Urban Architecture of Washington, D. C.
The Chicago Architecture Foundation (CAF) has just launched a $10 million campaign to pay for its new architecture center, which will be located inside Mies van der Rohe's One Illinois Center. 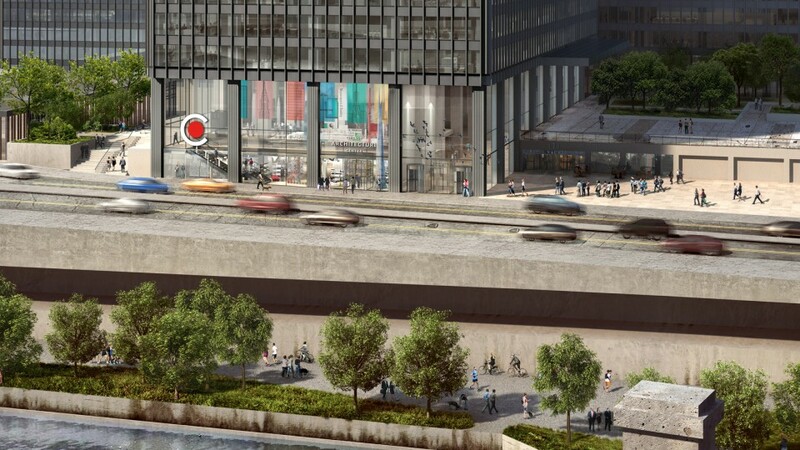 Hometown firm Adrian Smith + Gordon Gill Architecture is designing the space, which should open this summer. 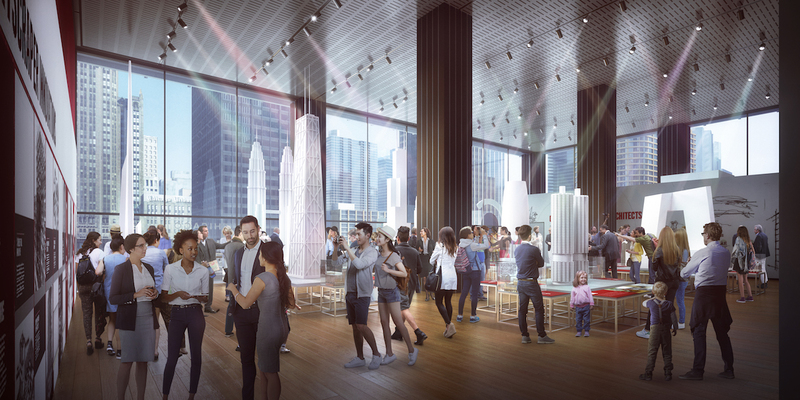 The 20,000-square-foot project, steps from the Chicago River at 111 East Wacker Drive, will host lectures, educational programming, and other events for industry professionals and visitors alike. Most notably, the renovations will increase the CAF's exhibition space from 1,600 to nearly 10,000 square feet. Currently, the CAF occupies the Railway Exchange Building, a Beaux Arts commercial building in the Loop by D.H. Burnham. 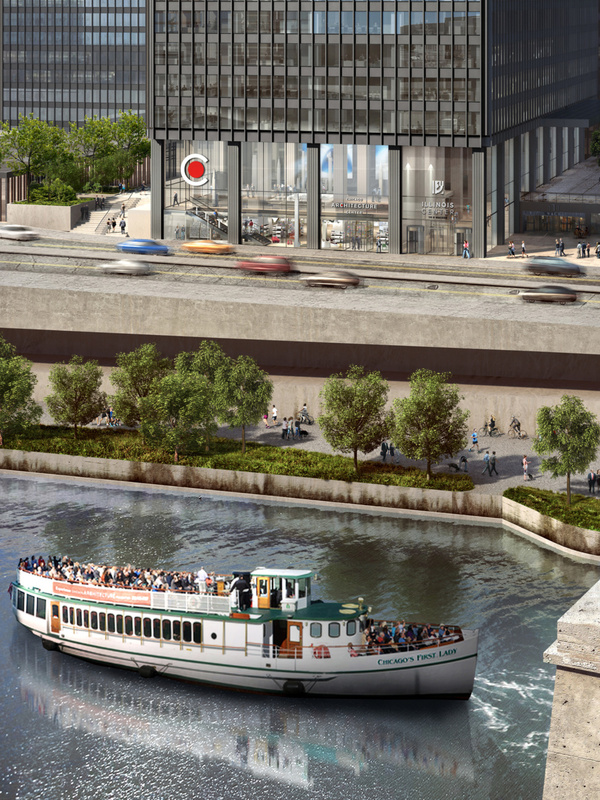 Turner Construction, developer Related Midwest, and steel and mining company ArcelorMittal are some of the major non-family donors supporting the project. As of earlier this month, the CAF is 60 percent of the way towards its $10 million fundraising goal. Of those dollars, $8 million will go towards the facility and its exhibits, and $2 million is earmarked for education programs. If you're willing to fork over a quarter-million-plus, the CAF says there are plenty of naming opportunities still available. 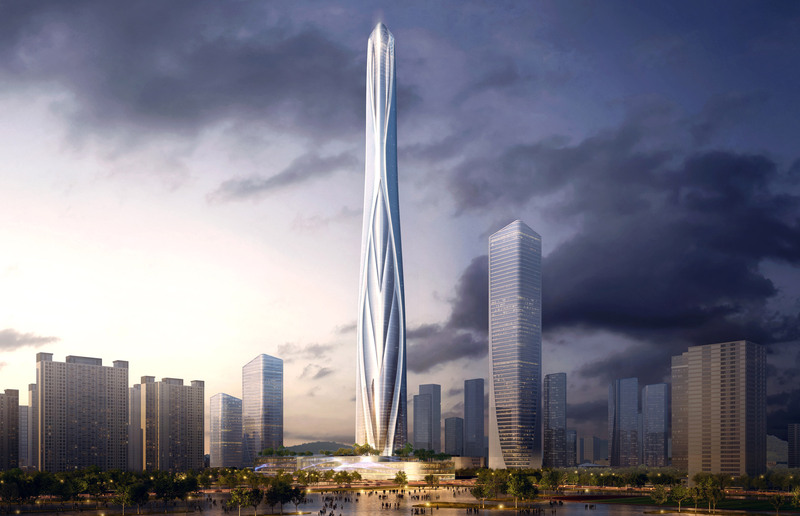 Construction on the world's tallest building is finally moving forward. 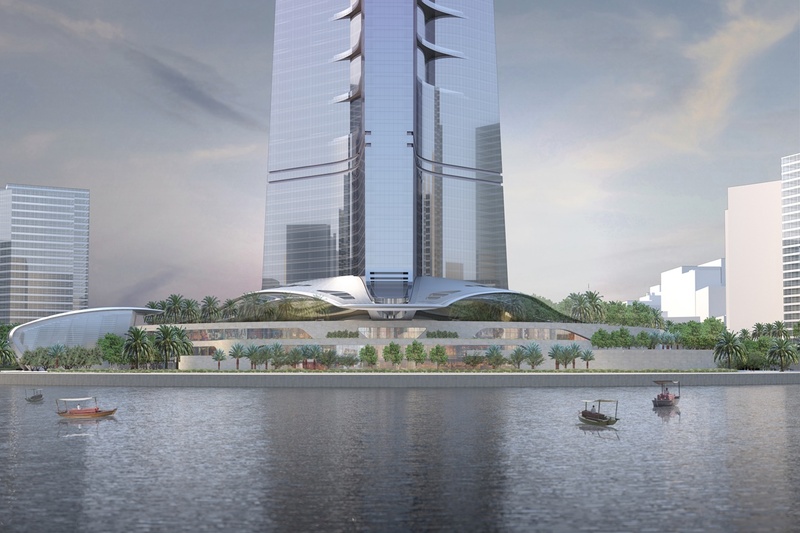 Officials from Jeddah Economic Company (JEC), the firm behind the Jeddah Tower, an almost 3,300-foot-tall cloudbuster, told area media that after some roadblocks, the $1.5 billion project is moving ahead. "We have faced delays. In projects of this magnitude you always have delays—I hope we'll recover the delays we've had," Mounib Hammoud, chief executive of JEC, told Times of Oman. "We will be open for business by 2020, hopefully." 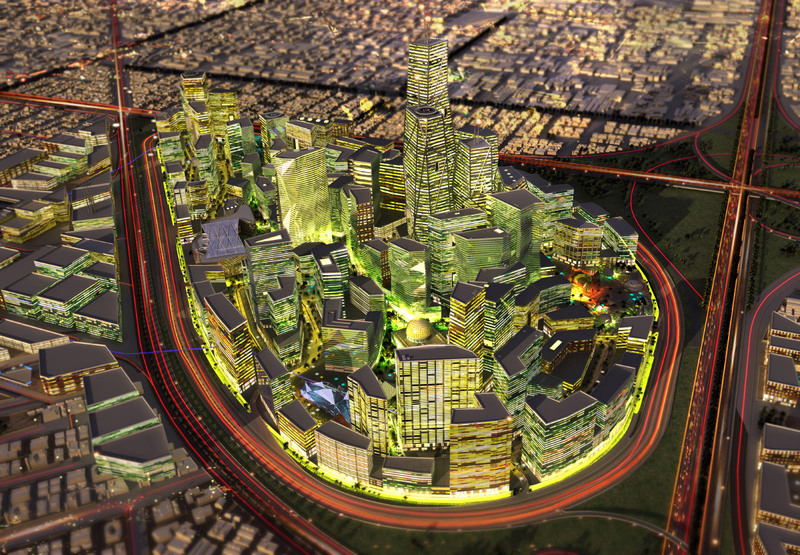 The tower, in Jeddah, Saudi Arabia, will feature apartments, a hotel, and retail. When it tops out, the Jeddah Tower will reach 3,281 feet, a full 559 feet taller than the Burj Khalifa in Dubai. 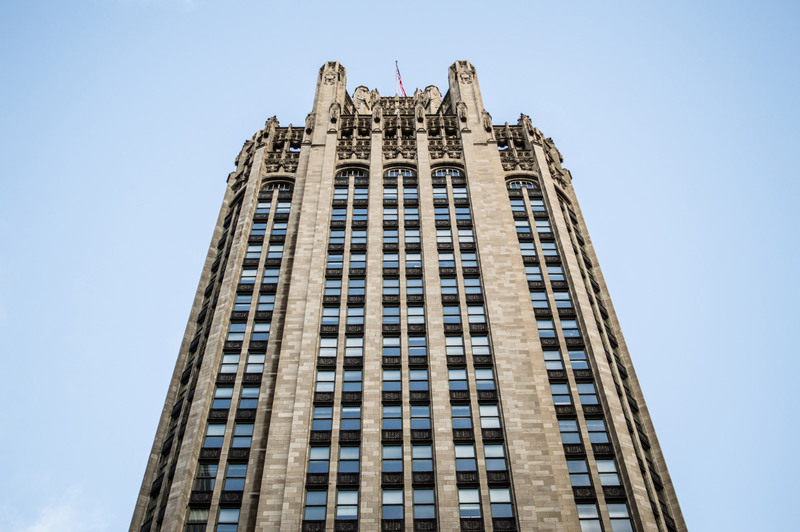 Both structures were designed by Chicago's Adrian Smith. Every week, structural engineers at Thornton Tomasetti have to check the concrete mixture to ensure changing temperatures and wind conditions don't affect the integrity of the building. So far, crews have ascended to the 63rd floor, and the concrete shell and cladding will be completed next year. 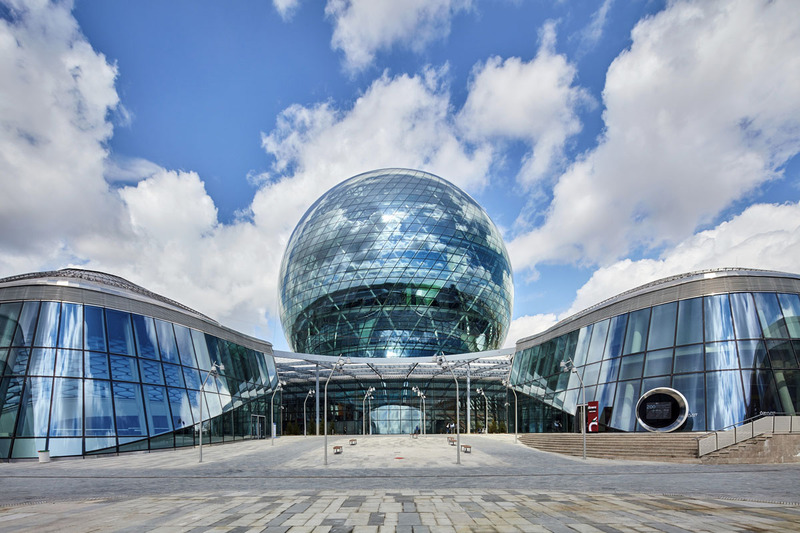 The form was inspired by expos of the past, like the Montreal Biodome from Expo ’67, as well as Kazakhstan’s president himself, who specifically told the firm he wanted a sphere, said Founding Partner Gordon Gill. But earlier examples failed to complete the circle—Gill’s team wanted to go further. “We said, ‘If we’re going to do that, let’s do a true sphere,’” Gill recounted. “Instead of segmented glass, we decided to do double-curved, insulated, fritted glass.” While the form posed engineering challenges due to the undefined transition of heat across its surface—which the team solved by using convection to move air throughout the space—fabricating the glass panels proved an engineering feat of its own. “We thought it was going to be pretty straightforward,” Gill said. “After all, doesn’t every car have double-curved glass on the windshield? But we only found three manufacturers on the planet that could deliver double-curved insulated glass.” Eventually choosing Italy’s Sunglass for the job, together they considered a number of designs, ultimately choosing to utilize a rhombus shape with horizontal members that could be rationalized with the floor line in installation. The building envelope is essentially a glazed unitized curtain wall system. 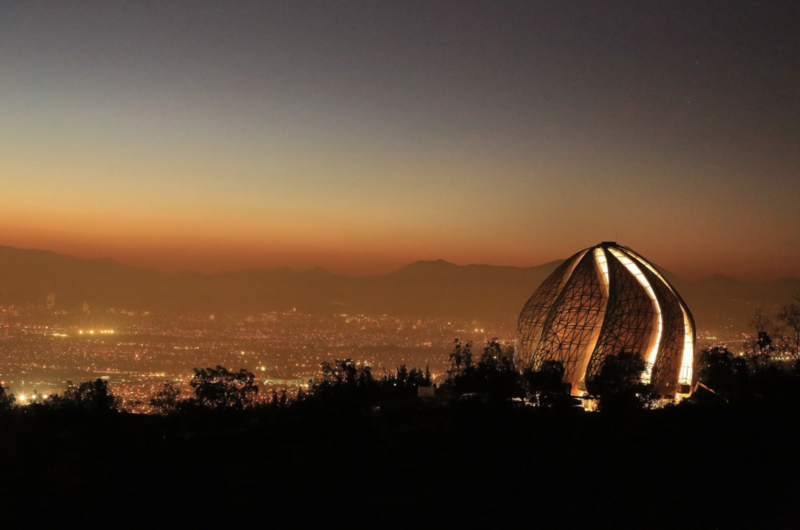 Aluminum mullions, which are supported off a primary and secondary steel frame system that forms an elegant diagrid shell, provide support and thermally isolated connections to the pavilion's doubly-curved insulated glazing units. A perforated enclosure housing a radiant heating system is supported off horizontal mullions. To the exterior, ceramic frit glazing is specified on the outboard laminated lite of the curtain wall, while ultra clear low-iron glass with a low-E coating was included throughout the project. The envelope also features integrated LED illumination and shading systems within the exterior curtain wall mullions. To maximize views from the inside and reduce the number of glass panels, they opted for a three-meter-sized lite for a total of about 2,900 double-curved spherical panels with an additional 315 double-curved panels to make up the side walls of the wind turbine inlet at the top of the sphere, as well as 388 flat panels with integrated photovoltaics from Ertex.